After several depressing, mopey episodes, we finally have an epic one again worthy of being watched several times! 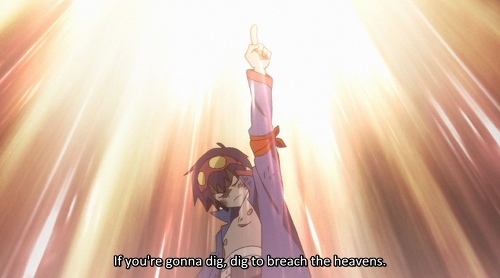 Gurren Lagann is back! 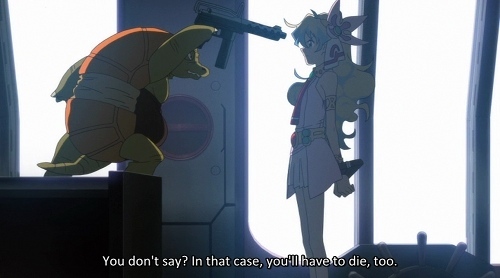 Plot: Eager to take on the barbarians on the surface after two aborted attempts by his colleagues to do so, the tortoise looking Guame goes out to reclaim Dai-Gurren with the most amount of fan service and evil smurking he can muster. Of course, he fails! Parody: Not content making subtle (and not so subtle!) 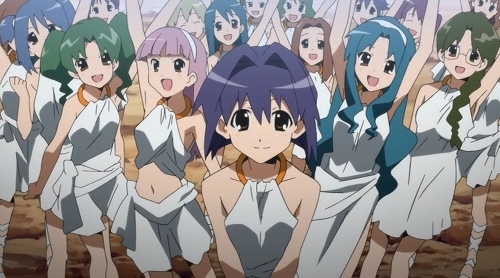 jabs at anime stereotypes, Gainax parioed the song of the siren with a town comprised entirely of attractive (though eerily similar) young women in white robes. I’ve seen that screenshot above floating around the net for years! Backfiring: By locking up Simon and the entire team in a room lined with rock to await their fate, little does Guame realise he was facilitating Simon’s rediscovery of his talent and motivation in life, as well as restoring his honour amongst everyone who had started to doubt him. Relationships: Was dissapointed in Yoko again this time, she was so ready to dismiss Simon again when things were tough. Fortunately Nia was a kind soul who took an interest in what he was doing, even when it was just digging and making sculptures of his lost friend. Technology: After being pictured amongst the litter on the deck of Dai-Gurren (a mighty fine land ship Gunmen that lacks garbage chutes, much like Australian apartments) Lagann miraculously comes back to life and is able to come to Simon’s aid. The key Simon has around his neck has incredible transmission strength! Explanations: So my initial assessment of Nia’s resting place as a status chamber was far more sinister. She and Simon understand now. 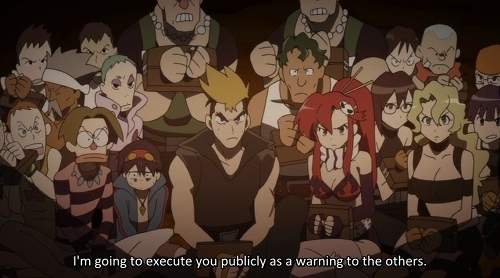 Legacy: Kamina is alive once again, through Simon. The epic moves, the passion and drive. Now all we need is for Simon’s confidence to translate into some lovable goofiness, and we’ll be all set. I’m confident he can do it :). 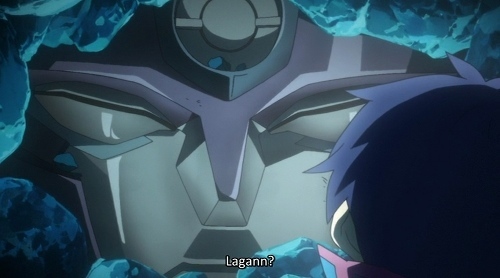 Flashbacks: When Simon sees Lagann after tunelling through rock. When he shoots into the air as its pilot and sees the rocky world below, with the epic sky; it was all the stuff episode one was again. A cliché english major at universitiy would claim it was a rebirth of Simon’s spirit, though I would never say anything as cheesy as that. Unanswered questions: How is a creature like that supposed to operate a firearm? 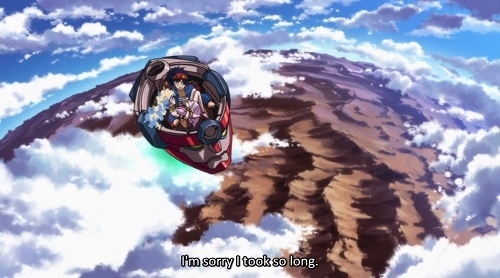 Conclusion: A real touch and go episode there at times, but I feel as though I’m watching Gurren Lagann again, and not a sad drama series; perhaps having those sad episodes just made me appreciate the epic ones even more. In any event, I’m excited to see what’s ahead, how’s Simon’s character develops, and what mindf*cks I can expect. I’ve been told there are several! Aside: This post was supposed to be auto-posted on Tuesday, but for some reason it only just went through. Sorry about that! Older post → What have you purchased online?